HTC's UltraPixel experiment was brave, but ultimately it failed. Now the company is back in the resolution race and it's a big jump with a 20MP BSI sensor. The HTC One M9 sensor sits behind an f/2.2 aperture and is 1/2.3" big, with the unusual 10:7 aspect ratio. Samsung Galaxy S6 has a wider aperture, f/1.9, which in photography speak, lets about half a stop more light. It's a 16:9 sensor and features optical image stabilization (OIS) to further help with photos in the dark. It has only a single-LED flash to fight HTC's dual-LED, dual-tone flash. The front-facing cameras are notable too. The 4MP UltraPixel camera now serves selfie duties. It's a fairly large BSI sensor with traditional 16:9 aspect ratio, behind a 26.8mm f/2.0 wide-angle lens. The autofocus has been removed though. Samsung has been putting 5MP selfie cameras on its recent flagships. The camera matches the f/1.9 aperture of the back camera, but it's a 4:3 sensor. Both it and the HTC selfie camera have HDR modes and can record QHD@30fps video. Both cameras have manual modes. The HTC one lets you manually adjust the focus, shutter speed, ISO or exposure compensation. The Samsung lacks the shutter speed adjustment, but it has sliders to control the highlights and shadows in the photo. Unfortunately, neither phone lets you manually control the focus or the other settings while shooting video. Other modes include selective focus - this time done with a single camera on the HTC One M9. It also offers Split capture (shoot with both cameras at the same time) and photo booth (for a retro 4-photo strip experience). The Samsung Galaxy S6 also offers virtual shot, which has you shoot a video by walking around a subject. After that the phone uses its gyroscopes to recreate that object as your turn the phone as if it's still in front of the camera. 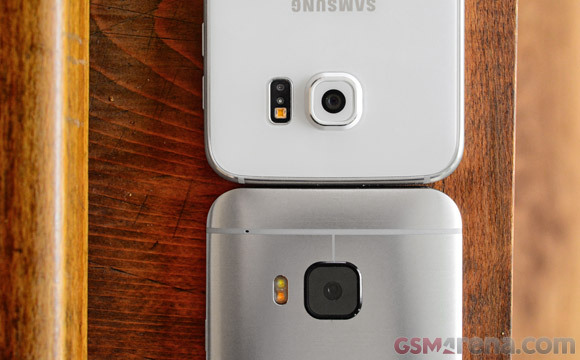 The two-camera photo, which was introduced on previous Galaxy flagships, is gone. At least you get a Wide selfie mode - like a panorama for selfies. Panorama and HDR go without saying. Both phones have ways to quickly launch the camera. On the Galaxy S6 you just need to double tap the Home key - anywhere in the UI, even when the screen is off. The HTC One M9 instead can launch the camera from a locked screen if you hold the phone horizontally and press the Volume up key. Both cameras wake up impressively fast, but the One M9 is quicker. Update, April 3: we received a retail Galaxy S6 unit and took new camera samples to check if the image quality has changed - it hasn't. In broad daylight a higher resolution is an advantage - there's plenty of light to keep the noise down. The HTC One M9 is indeed much better than its two UltraPixel-packing predecessors were. In terms of color rendering the HTC boosts the blue and red channels, while the green one is a bit weak. 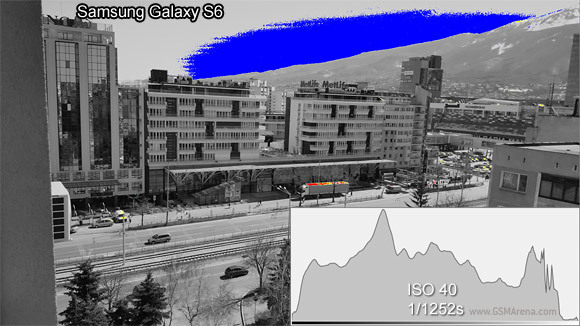 The Samsung camera is more balanced and has accurate white balance, while its opponent leans very slightly to a cooler (bluer) white balance. In terms of captured detail the One M9 is very competitive, capturing even fine detail. It does apply some sharpening to get there though. What lets it down, however, is the noise reduction, which leaves the image looking blotted when magnified to a 1:1 pixel size. It's especially visible in foliage, Samsung's precessing is just more mature. That's not to say it does a perfect job. It's slightly softer than the Galaxy Note 4, so this was a good opportunity for HTC to strike. Let's look at the dynamic range. We picked out the two photos that had the closest exposure and enabled the mode in the photo editor that shows overexposed/underexposed areas. We've also added a histogram overlay, which shows the tonal distribution. Reading the histogram, the Samsung Galaxy S6 photo is slightly brighter but also the tonal distribution is more balanced. The One M9 photo has a more of the darker tones and the shadowy spots on the photo are way too dark. 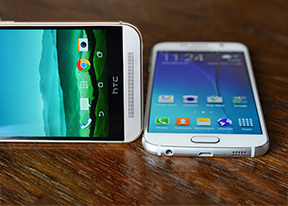 And even though the Galaxy S6 image is brighter there is less blowout than the HTC One M9. Even though a lot of the sky was overexposed, that wasn't enough to render better detail in the shadows. 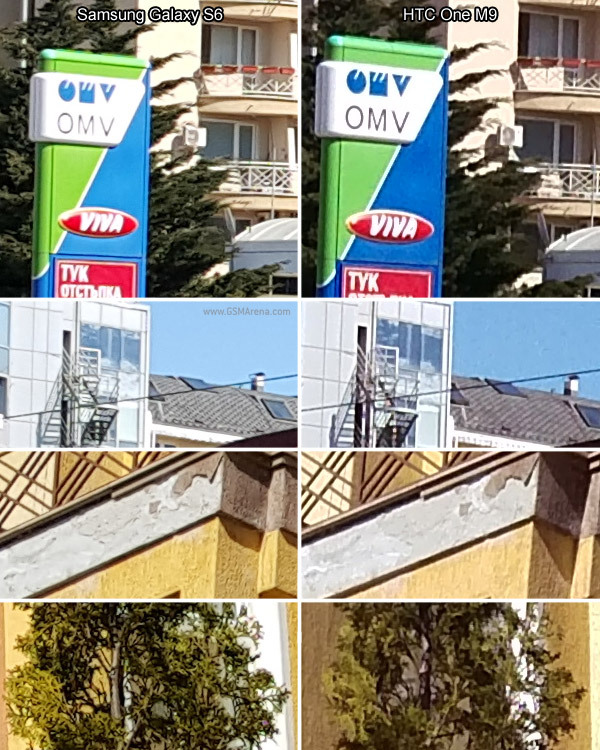 Since the images of both phones are equally contrasty, we would guess the most likely explanation for the wider blowouts on the HTC One M9 photos is a smaller dynamic range. Here are some camera samples from both phones for your perusal. Winner: Samsung Galaxy S6. 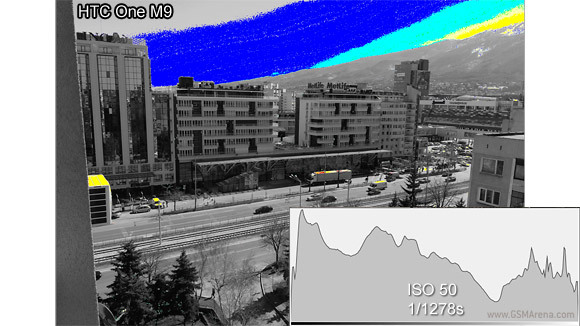 It has a wider dynamic range and manages to capture more detail due to its more mature image processing. The HTC One M9 put up a good fight, but just wasn't enough. It's a good camera on its own and processing can be fixed, but there's nothing to be done about the comparatively limited dynamic range.